Now Spain is heading for its third consecutive year of economic growth of just over 3%, the fastest of any large economy in the euro area (see chart 1). It is creating about 500,000 jobs a year. According to Luis de Guindos, the economy minister, last month the country’s GDP surpassed its pre-crisis peak. Let's hope Catalonia don't vote to leave. How far up their own asses are these politicians? 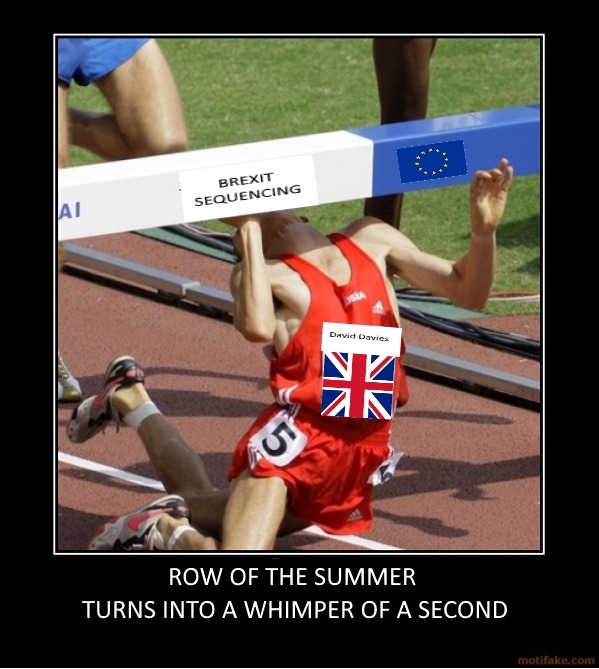 At least the battle of the summer is finally over and we can get to negotiating Brexit. What's that? The battle of the summer lasted a few hours before Davis backed down and made his bravado and hubris look like just that completely undermining what he says?! Oh. I assume he thought it would be a vote winner. After all the PM saw a spike in Tory popularity after she accused Brussels of meddling in the election. Obviously none of it led to a stonking majority as predicted. Hopefully they have learned their lesson. It would have been so much easier to focus on the "sufficient progress" angle, which is nuanced and crucial. There has seemingly been talk of Davis saying Thursday's citizenship proposal was an "opening offer" suggesting an ongoing discussion. Knowing the PM (who is presenting it) she'll probably throw the documents on the floor, shout "take it or leave it", do a dirty protest in the room and storm out. There has seemingly been talk of Davis saying Thursday's citizenship proposal is an "opening offer" suggesting an ongoing discussion. Knowing the PM (who is presenting it) she'll probably throw the documents on the floor, shout "take it or leave it", do a dirty protest in the room and storm out. Then the EU will leave it and the next day she'll stand in front of Downing Street saying they've accepted it. Problem with Davies is he's not 1/10th as smart as he likes to think, an organised Barnier will wipe the floor with him. Lillico from March. Fair play! The "row of the summer" didn't make it mid summers day. Excellent. 1 day! The EU already shifted their position earlier in the year. First it was "no parallel talks on trade", then it became "parallel talks with sufficient progress" which I believe May indicated she would be accepting prior to the election. Sky reporting that trade talks pencilled in for October. According to the DExEU Secretary there has been communication back and forwards behind the scenes for some time now. It's "Davis" haggis, and he didn't come in the last shower. He negotiated with the EU for years, Barnier included. No they didn't. They produced a shcedule for the talks and Davis responded with bluster about the row of the summer. See the snippet from Lilico above. Note the lack of an alternative that they were prepared to publish to the EUs position. Anyway, it's for the best. Dates for your #brexit diary. Sound of spluttering in the Brussels press room. No one works in works in August. Both Davis and Barnier stated today that the UK is leaving the single market and the customs union. Barnier was just repeating the British governments avowed position, not sure what else he would say? everyone in Europe at a serious level of Politics knew this. I wouldn't read anything into that, I suspect Barnier doesn't really know what he's doing. I have it on good authority he hasn't even spoken to Silver yet so he probably doesn't even understand the difference between the EU, the single market, the customs union and hockey sticks. It's sad the home of the cuckoo clock has to point this out. Well, I am waiting on Bimbo's opinion before forming my own. There's bound to be a short sentence that's going to negate everything written in that article. Red white and blue shitstorm! One good thing about the times in which we live is that we are getting a very rapid turnaround on "are this person's opinions and utterances worth taking the slightest bit seriously?" The UK send in clueless, naive children and they have been smacked back. But a long way to go yet but at this time we do need a PM who is not a fool (not May). That piece from 'Der Bund' is as good a recent synopsis of events that I have read. Good article, although the Tories clearly aren't very right wing at all. Its not difficult but our incompetent leaders don't have a clue. What's this "we" shite dickhead? Silver if you think that the EU is a racket run by criminals its best that you leave. Regardless of your opinions Europe has the highest standard of living for the largest amount of its population in the world which is a pretty good goal. Yes we dont have bragging rights as to billionaires and media moguls. But having a slew of celebrities and wasters does not put food on the table. The UK wants to be mini USA (economically) that is not compatible with our Social Democratic values. If being a social democrat or a liberal is synonymous with being a criminal in your book it is obvious that your tinfoil hat has as much power as homeopathic medicine. The opinion piece posted above by Rocketz. You must be the only guy on this thread to not have the greatest contra indicator of all time on ignore...!! ...I do have him on ignore, which is why I didn't see the post. Sun God I am honored, but what is a contra indicator? I am talking about Silver, not Rocketz. The EU is not Europe. The EU leeches of Europe based on lies and misinformation. How much better off would Europe be today with the single market but without the Euro and political union? Germany would be worse off but Greece, Spain, Italy, Portugal would be much better off. So the Eu and Euro benefits Germany but harm's a good number of countries. They are now trying to bully countries to force them to take in refugees. That these countries had no say over letting in. when will countries find their collective inner strength and tell the EU criminal to f++k off. The European Commission President JEAN-CLAUDE Juncker, has come out and boldly stated that Poland and Hungary and their refusal to take in a single refugee person under a plan agreed in 2015 to relocate 160,000 asylum-seekers from Italy and Greece, said: “Those who do not want to accept people with a different skin colour or a different belief come from a world of ideas that I do not consider compatible with the EU’s original mission.” Juncker further said that if the refugee crisis existed previously and Poland and Hungary refused to accept the refugees, they would have been denied membership. The entire refugee crisis was created by Angela Merkel. It was never presented for a vote to the member states. The EU has proven that there is no right to vote and it has become an unelected government with authoritarian powers. Juncker never stands for election by the people. The establishment of the EU government is its a throwback to the days of kings claiming the divine right to rule. Meanwhile, estimates of refugees who would still migrate to Europe range in the 30 to 35 million. This indeed seems high for that is 10% of the population of the United States. Even if it is half that amount, it would break the economy of Europe and crush it into dust. You have an excess of people totally unfamiliar with Western culture or with a skill set capable of the 21st century. Last edited by Silver on Tue Jun 20, 2017 10:22 am, edited 1 time in total. Quoting convicted criminals now, sums you up really silvermong. Last edited by Gavin Duffy on Tue Jun 20, 2017 10:25 am, edited 1 time in total. Chuckles. I see you as a brainwashed, brain-dead idiot. I don't care if you have me on ignore so no need to keep on telling me you f++k-wit, naive, pathetic child. Interesting that the more the disadvantages of Brexit are examined, the more the British dig their heels in.